This unique, colorful squeegee is perhaps our most versatile squeegee. It has two super soft and flexible 10 inch wiping blades which are designed to be used in a back n' forth motion saving time and effort. 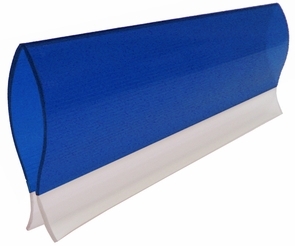 It's perfect for use surfaces with an irregular or curved surface. Use it to wipe down boats, clear water off freshly washed cars or on windows and mirrors ... your choice. So What Makes This Squeegee Special?